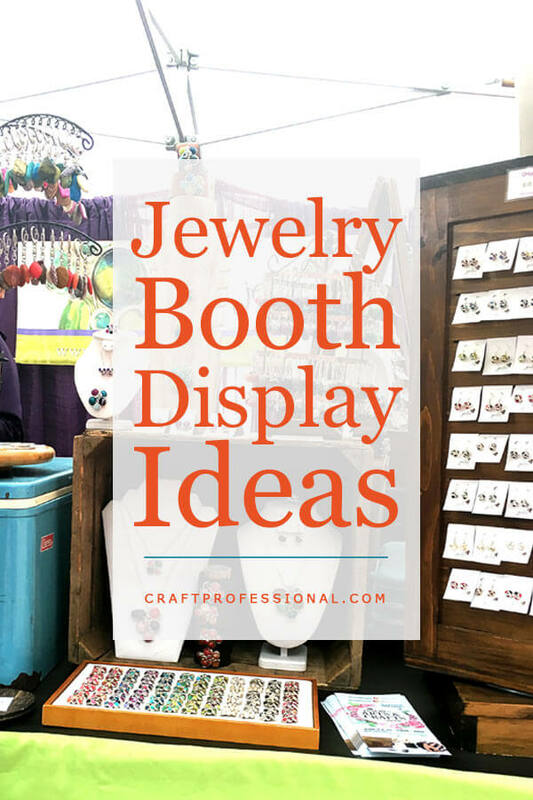 I saw plenty of jewelry booth display ideas at a recent outdoor craft show, but there was one booth that truly stood out from the rest. 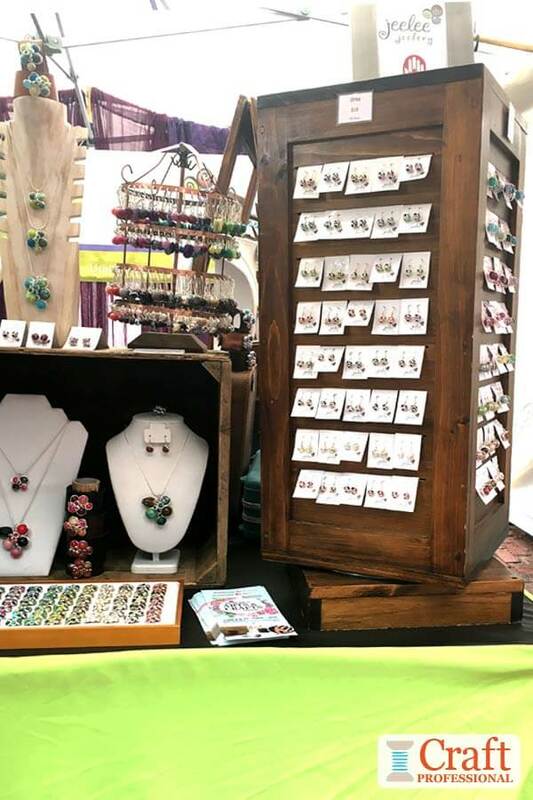 It was bright, inviting, and clearly communicated the jewelry designer's style from a distance, but, at the same time, it didn't follow all of the typical "rules" of jewelry booth design. This booth is gorgeous and has so much going on. It was in a fantastic space that was open to customers on three sides, so there was plenty of space for displaying jewelry. There's a lot going on in this booth, but it's pulled together with neutral browns and whites in the displays accented with bright green and purple that are the company's signature colors. This first photo shows the left side of the display. Notice the variety of levels created throughout the booth. The wooden display elements are all the same shade, which pulls everything together. I love the earring stand sitting on top of a vintage suitcase. The suitcase adds a little height and interest in the display, and it's a practical item that would be quite useful for transporting and storing items. The jewelry busts are all white, so, although there are a variety of styles here, the single color hold everything together. 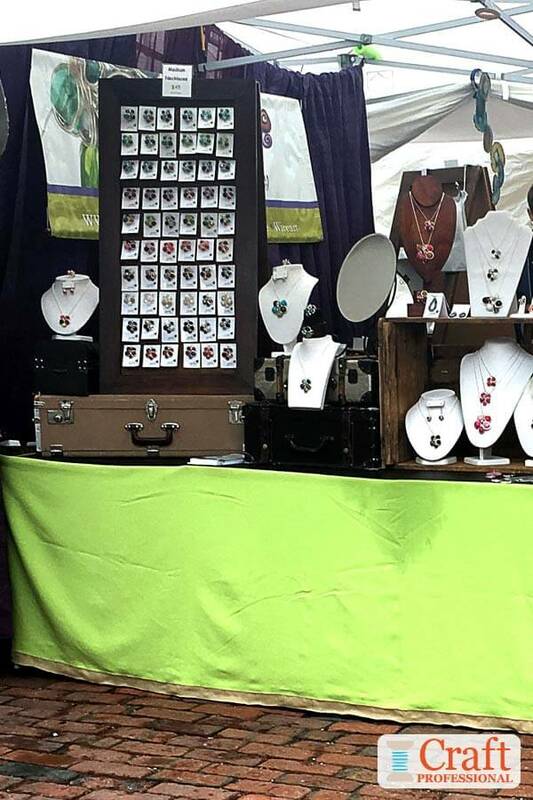 A mirror is always a smart addition to a jewelry booth, encouraging customers to check how they look in the fun designs. In the next photo, you can see the front view of the booth, and a wider shot gives you a better overall feel for the look of the display. The bright green table covering is a signature color for this brand, and it makes a big impression from a distance. In the back corner, you can just barely see regal purple curtains hung from the tent frame. The green and purple together are the brand colors for this designer, and they do a great job of communicating the fun, whimsical feel of her colorful jewelry. It's not obvious because the photo is a little blown out, but there are bright purple umbrellas placed in each corner of the tent. I don't know if the umbrellas play a functional role (it was raining that day), but they are definitely eye-catching and add an element of fun to the display. The last two photos (above) show a closer view of the front of the booth. I love the use of wood crates throughout the booth. They create perfect little nooks to feature special pieces of jewelry, and, like the vintage suitcase, they must be excellent for transportation and storage as well. I've seen this booth at several shows, and it's never exactly the same from show to show. It has an extremely flexible design and can be configured to fit a variety of situations and spaces. I find this booth so interesting because it approaches jewelry display a bit differently than usual. That is, there are no large product photos showing off the designer's style, but, in spite of that, you can get a feel for the brand's style from a distance, even without seeing the jewelry. 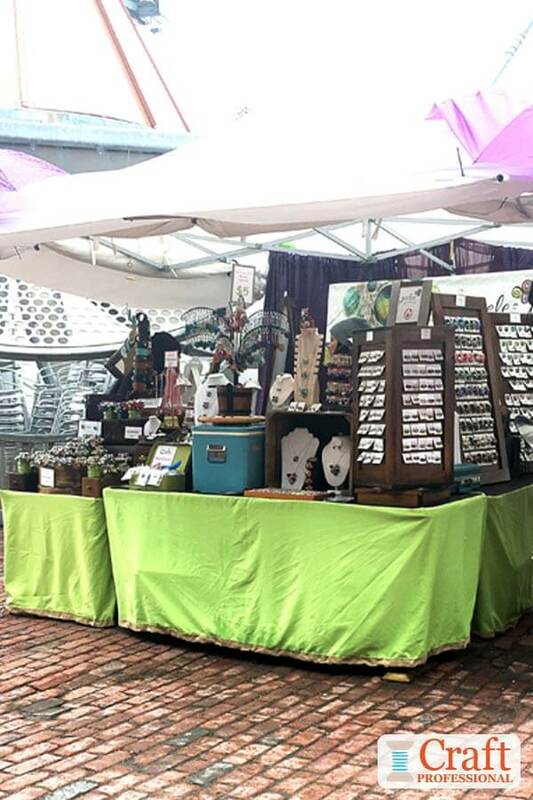 The bright colors in the table coverings and curtains, as well as the umbrellas create a whimsical appeal that perfectly communicates the bright, whimsical jewelry you discover within the booth. Typically, you hear you shouldn't display too much jewelry at once, but this booth is packed full of product. 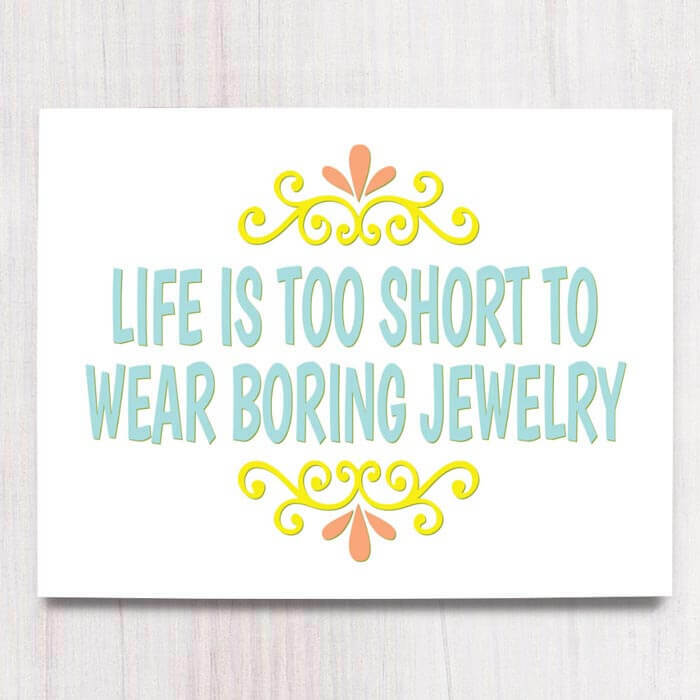 This approach works because it suits the jewelry style. 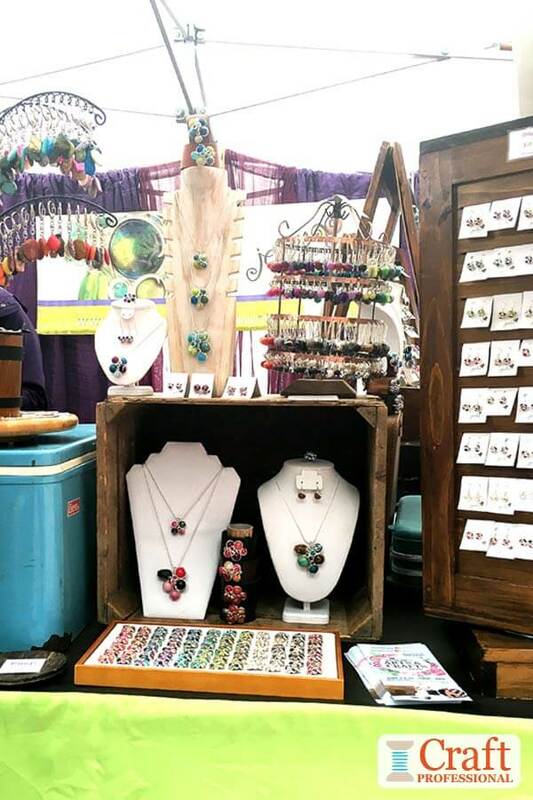 The full booth is fun, lively, and cheery, exactly like the jewelry on display!